Warm up 8/10 Refer back to your class syllabus for following questions. 1.What is your on line textbook website?. 2. What is Ms. Baiks website ? 3.What. 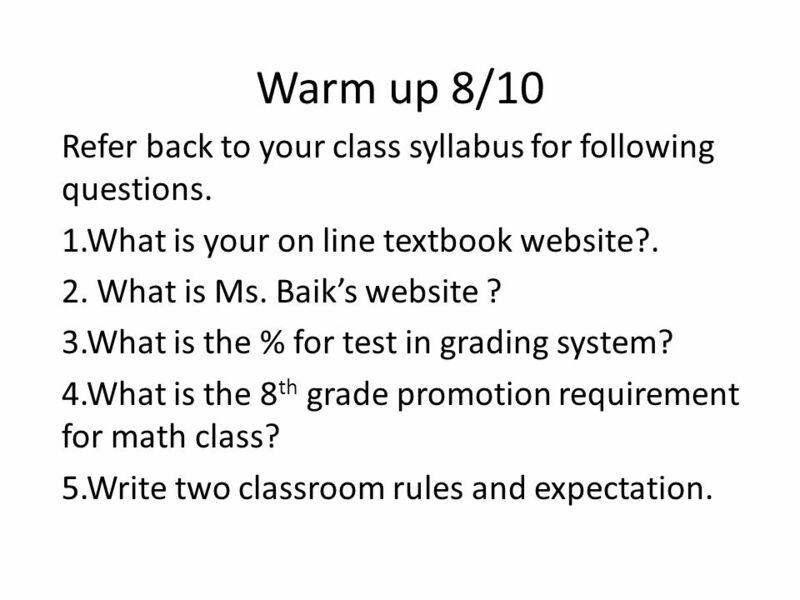 1 Warm up 8/10 Refer back to your class syllabus for following questions. 1.What is your on line textbook website?. 2. What is Ms. Baiks website ? 3.What is the % for test in grading system? 4.What is the 8 th grade promotion requirement for math class? 5.Write two classroom rules and expectation. 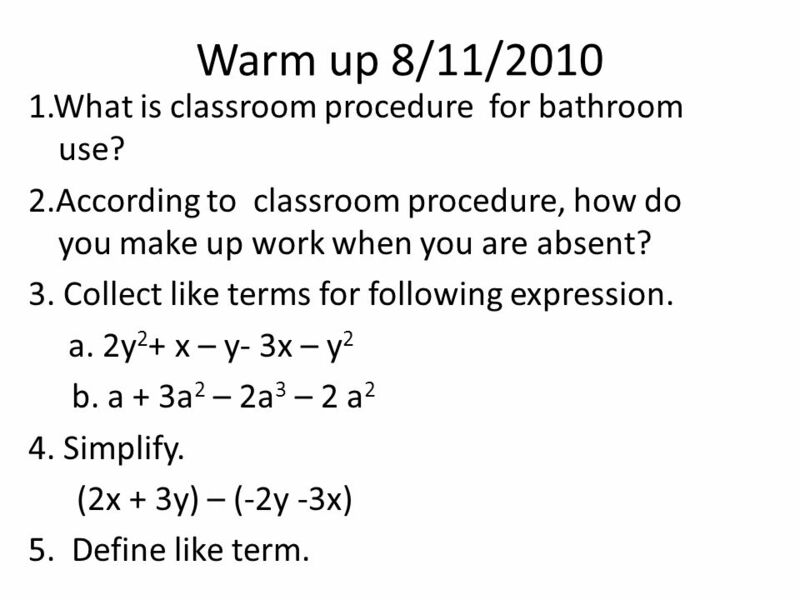 2 Warm up 8/11/2010 1.What is classroom procedure for bathroom use? 2.According to classroom procedure, how do you make up work when you are absent? 3. Collect like terms for following expression. a. 2y 2 + x – y- 3x – y 2 b. a + 3a 2 – 2a 3 – 2 a 2 4. Simplify. (2x + 3y) – (-2y -3x) 5. Define like term. 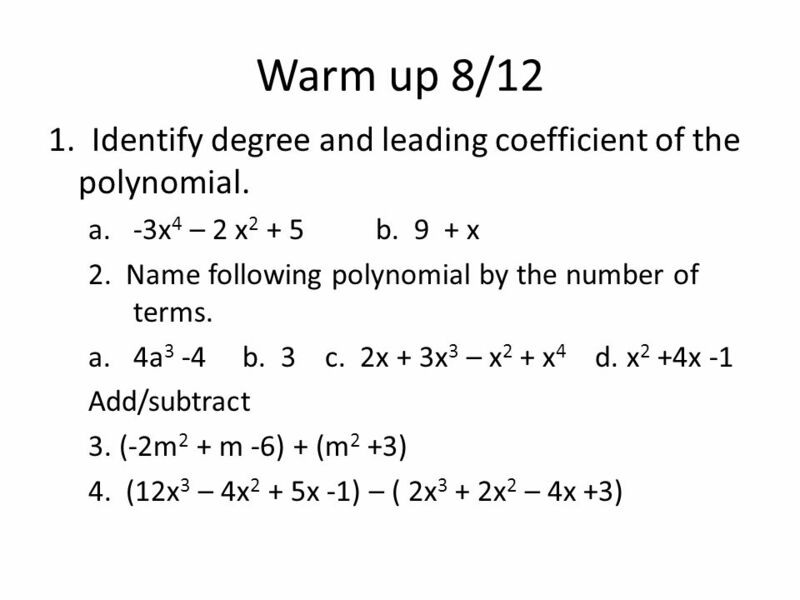 Download ppt "Warm up 8/10 Refer back to your class syllabus for following questions. 1.What is your on line textbook website?. 2. What is Ms. Baiks website ? 3.What." Fractions VIII Subtracting Like Denominators By Monica Yuskaitis. Add or subtract 1. (x 2 + 4x – 1) + (5x 2 – 6x + 4) 2. (5y 2 – 9y + 1) – (7y 2 – 8y – 6) Find the product 3. (x – 6)(3x + 4) 4. (2x + 5)(3x + 4) 6x 2 – 2x. Simplify Warm-up. Compare and Contrast Notes - Adding and Subtracting with LIKE Denominators When you are adding or subtracting rational expressions…. Adding/Subtracting/Multiplying Exponents when bases are the same Absent Tues/Wed 11/13,14. Adding and Subtracting Polynomials Whats a polynomial? Distribution and like terms A look at the algebra behind algebra tiles…. Do Now: You may not use a calculator!